I’ve mentioned this before. Fall is my favorite time of year because of all the rich colors nature displays. Though it’s sad to think of plants and trees dying or at least going dormant, Nature is giving us one last burst of glorious color before going to sleep. It’s nice to know that autumn is such a beautiful part of the cycle of life. My project for today is my celebration of autumnal colors. Hope you like this project. Have a great day! Wet, but do not over saturate an A2-sized (4.25”x5.5”) piece of watercolor paper with water. Drop in the chosen Distress Inks using a large wet mop brush and let the colors move on their own. You may want to blot very wet areas with a dry paper towel if some areas are becoming to wet or intense for the effect you want. Allow the water-colored background to dry thoroughly. Die-cut the flower onto an A2-sized piece of metallic bronze-colored cardstock using a metal shim. Metallic cardstock is thick, and the die-cut is detailed. Therefore, you may want to run the die back and forth in your die-cut machine to insure everything cuts through. Cut down the dried water-colored background to be slightly larger than the opening of the die-cut flower window. Save the scraps from the water-colored background. Use strong adhesive on the back of the die-cut flower panel around the window opening of the flower. I used a combination of scor-tape and dots of liquid adhesive on the die-cut flower panel. Strong adhesive is needed to secure the slightly warped watercolor panel. Carefully place the water-colored background onto the back of the die-cut flower panel behind the die-cut flower area. Adhere entire panel to a brown A2 card base. Die-cut the word ‘Autumn’ three times and adhere each of the three words together to give the word a dimensional look. Adhere the word to the front panel, just below the window. I used liquid glue for this. Punch tiny leaves cut from the scraps saved when the watercolor background was cut. Add gold sequins to finish off the card. Simon Says Stamp: Cosmo Flower Frame wafer die. Peeled Paint, Spiced Marmalade, Ripe Persimmon, Wild Honey, Mustard Seed. Distress Watercolor Card Stock (for background behind the flower window). Stardream metallic cardstock in Bronze (for cutting the Cosmo flower frame. Pretty Pink Posh gold sequins (4mm and 6mm). 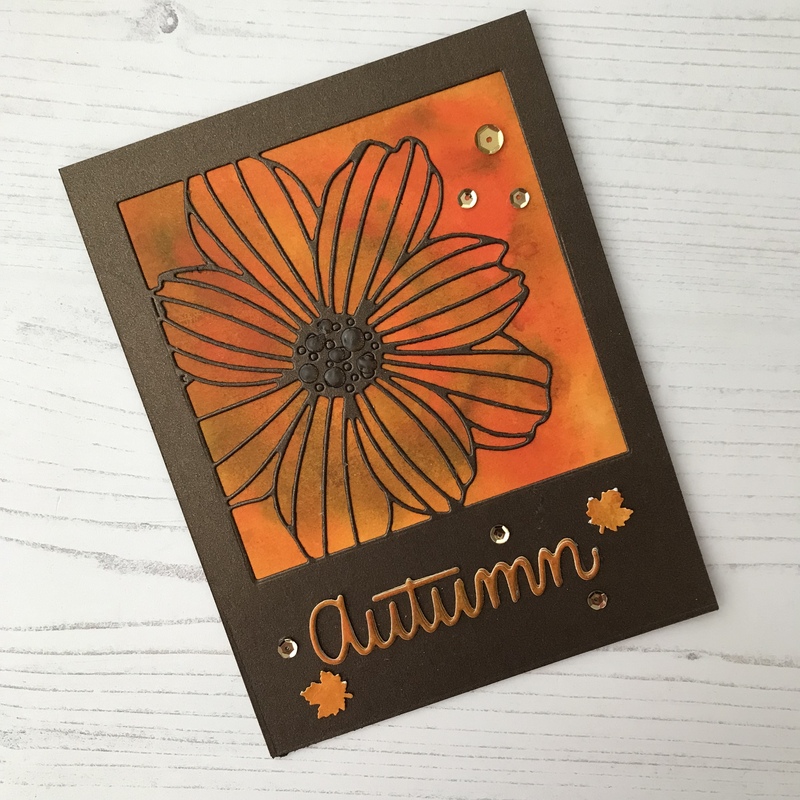 This entry was posted in Floral, Seasons and tagged #simonsaystamp. Bookmark the permalink.